Hatch no longer makes the leather wrist length glove with kevlar lining I wore for 25 years but this is a good substitute. PROS: These gloves are comfortable, and there is very good grip on the palms. CONS: They are bulkier than I would like. They are not warm enough to warrant the thickness. OVERALL: Decent for the price. Probably not the best as a "shooting glove." but allow enough dexterity to be used as a General Duty glove. 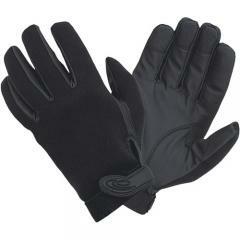 Push comes to shove they are going to be a lot better than a generic winter glove for Police work. Great gloves, they made a great gift. I been using the normal NS430 gloves goin on 15 years, when they start gettin old I order a new pair n cut trigger finger & thumb off of em. Lost or misplaced my NS430L gloves living in Fla I never needed them, now Im in Mich n wish I had them They are pretty bulky and clumsy as mentioned by others and my reason for not rating 5 stars. Too thick & bulky for practical reasons. These will definitely keep you warm, but the dexterity may be an issue for normal patrol work. I was hoping the index finger was going to be a more conform fit for a better trigger feel but , super warm , high quality, great gloves. I'm looking forward to using them at the outdoor range this winter.